An evening downpour, no-show leadership, and a lingering weed-haze resulted in dismal attendance at Friday’s Cover the Night. 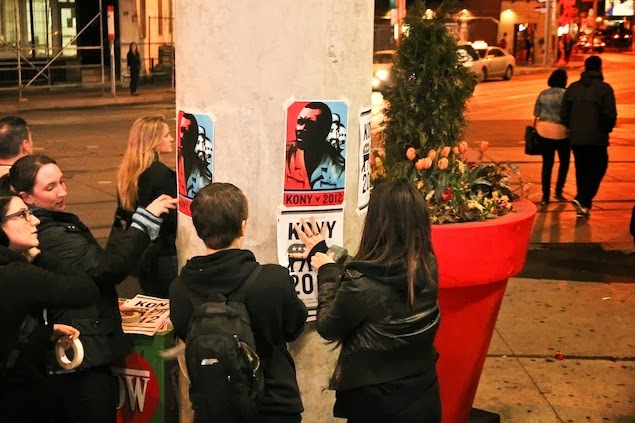 The gathering—part of a worldwide effort by non-profit organization Invisible Children to “cover the night” with posters about Ugandan cult leader and guerrilla fighter Joseph Kony—had 6,500 confirmed attendees on Facebook. But by 10 p.m. on Friday, most of the small crowd gathered in Dundas Square were those lingering from the day’s earlier pro-weed rally. Only about 40 people showed up with stencils, homemade posters, photocopied flyers, and official Kony 2012 action kits.